Everybody’s talking about it. Where did you get your dress? Are you going in a limo or party bus? Who are you going with? My prom was two years ago, and yet wherever I go, prom is all I hear about. There’s a brand new movie dedicated to it, and why? 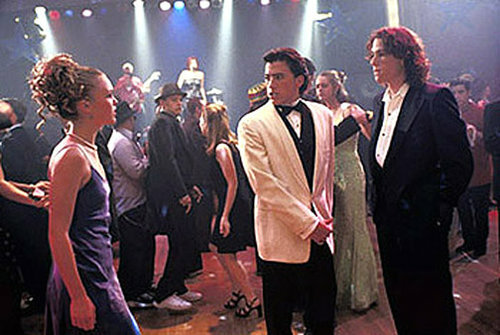 All of my 90’s romantic comedies already feature a huge prom storyline, usually involving a nerdy girl and the Brad Pitt of high school, so I’m not sure why Disney felt a need to create a brand new movie on the subject. Our modern culture tells us that prom night is the one night where you can feel like a princess at a ball, with Prince Charming on your arm. The night is supposed to be magical — that perfect evening when everything falls into place. Anyone who chooses to miss out on such a night is obviously crazy. Looking back, I realize how meaningless it all really was. As someone whose friends forced her to go to prom, I can still remember all of the desperate arguments that “You’ll regret not going!” So I did shop for the dress (which, I’ll admit, was gorgeous) and had my hair styled for the occasion, but the dance itself was easily a disappointment. Two years later, I can recognize that prom was one of the least defining moments in my high school career. Even more revolutionary was realizing how little high school means to me now. Yes, I did meet a few of my closest friends there (and I am not discounting them! ), but for the most part, high school became a series of mental snapshots that I rarely look through now that I’m in college. When you’re young, two years can mean a lifetime, and now that such time has passed, much of my high school experience feels like part of someone else’s life, not mine. A good friend of mine at college often argues that I must have been one of the cool kids in high school, which always makes me laugh. Much like now, I was a huge nerd — but at the time, I was a nerd who knew very little about herself or anything else. I don’t remember there being a stereotypical “cool” clique to begin with, and while a glance through my yearbook brings back to mind an overload of memories and gossip, high school itself is not something that shapes who I am now. I hope that any high school students who aren’t enamored with the experience will realize that life gets a whole lot better, and that the things that drive you crazy now probably won’t mean much to you in the future. Soon enough, the story about the boy who broke your heart before Homecoming will seem funny, you’ll forget about the various cliques and prom night will become one of those mental snapshots that won’t have a major impact on you. I agree with you 100% about prom, Val. Regarding current high school kids, if you want to go — and you do end up going — then great! However, for those who don’t want to go, you’re definitely not going to have an emptier life in the grand scheme of things if you stay home haha, nor is it going to be one of the things that you regret for the rest of your life. There are some things from before college (and from even before high school too) that I still regret to this day, but missing a big dance or two (or more =P ) definitely is NOT on the list. Similar to what you said, Val, life after high school is very much a clean slate where life starts anew, and where you quickly grow so much that most things from high school don’t matter anymore. What’s much more important, I’d say, is to do justice to the time and chances during the few college-age years, because from what I’ve seen so far, that’s when one has the biggest chance to become who one wants to be for the rest of one’s life. Of course, there are still chances after college age, but they seem to be much more difficult (due to the more pressing duty of needing to be out in the work force and supporting oneself, by any means and with any job one is currently qualified for). Not saying anyone shouldn’t go! But don’t feel like you HAVE to go , either.